Integrated Ocean Drilling Program (IODP) Expedition 335 “Superfast Spreading Rate Crust 4” returned to deepen Ocean Drilling Program (ODP) Hole 1256D several hundred meters into cumulate gabbros to understand the formation of ocean crust accreted at fast spreading ridges. Site 1256 is located in 15 Ma crust formed at the East Pacific Rise during an episode of superfast ocean spreading (>200 mm/yr full rate) and exploits the inverse relationship between spreading rate and the depth to seismically imaged magma chambers at modern mid-ocean ridges. Three earlier cruises to Hole 1256D have drilled 1507 m through the sediments, lavas and dikes and 100 m into a complex dike-gabbro transition zone. 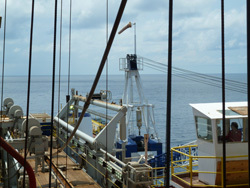 The specific objectives of IODP Expedition 335 were to : (1) test models of magmatic accretion at fast spreading ocean ridges ; (2) quantify the vigor of hydrothermal cooling of the lower crust ; (3) establish the geological meaning of the seismic Layer 2-3 boundary ; and (4) estimate the contribution of lower crustal gabbros to marine magnetic anomalies. Operations proved challenging from the outset with almost three weeks spent re-opening and securing unstable sections of Hole 1256D. When coring commenced, the absolute destruction of a hard-formation C9 rotary coring bit required further remedial operations to remove junk and huge volumes of accumulated drill cuttings. A minor advance to 1522 mbsf was achieved. Hole-cleaning operations returned large (up to 3.5 kg) samples that preserve hitherto unseen magmatic, hydrothermal and structural relationships. The dike-gabbro transition zone sampled in Hole 1256D to date is over 170 m thick, of which >100 m are contact metamorphosed granoblastic basalts. This zone records a dynamically evolving thermal boundary between the principally hydrothermal domain of the upper crust and a deeper zone of intrusive magmatism. The samples document intimate coupling between temporally and spatially intercalated intrusive, hydrothermal, contact metamorphic, partial melting and retrogressive processes. Although operational difficulties precluded the achievement of primary objectives, Hole 1256D has been thoroughly cleared of junk and drill cuttings that have hampered operations during this and previous Expeditions. At the end of Expedition 335, we briefly resumed coring and stabilized problematic intervals with cement. Hole 1256D is open to its full depth. Deepening this important reference hole into intact ocean crust should be undertaken in the near future to achieve long standing primary goals of scientific ocean drilling. Ildefonse, B., Teagle, D.A.H., Blum, P., and IODP Expedition 335 Scientists, 2011. Battling through the thermal boundary layer : Deep sampling in ODP Hole 1256D during IODP Expedition 335 (Invited). Abstract V13F-01 presented at 2011 Fall Meeting, AGU, San Francisco, Calif., 3-9 Dec.
France L., Ildefonse B., Koepke J., Godard M. & MacLeod C., 2010. Melting the Hydrothermally Altered Sheeted Dike Complex : Chemical Composition of the Main MORB Crustal Contaminant. Goldschmidt 2010, June 13-18, Knoxville, Tenessee. France, L., Ildefonse, B., and Koepke, J., 2009. Dynamics of the Axial Melt Lens/Dike transition at fast spreading ridges : assimilation and hydrous partial melting. EGU General Assembly 2009, Vienna (Austria), April 19-24, 2009. Geophysical Research Abstracts, Vol. 11, EGU2009-10159. Violay, M., Pezard, P.A., Ildefonse, B., Belghoul, A., and Mainprice, D., 2009. 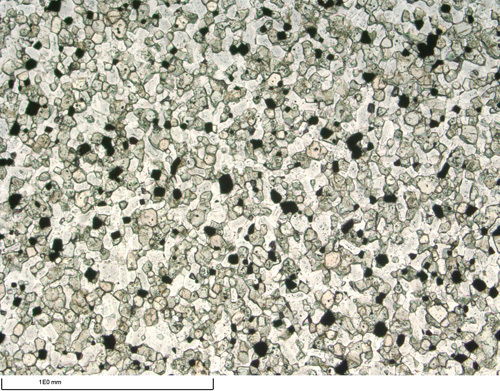 Petrophysical characterization of the hydrothermal root zone in the sheeted dike complex from IODP Hole 1256D. Geophysical Research Abstracts, Vol. 11, EGU2009-5636. France, L., Ildefonse, B., and Koepke, J., 2008. The fossilisation of a dynamic melt lens at fast spreading centers : insights from the Oman ophiolite. Eos Trans. AGU, 89(53), Fall Meet. Suppl., Abstract V51F-2111.